I have a 6 year old italian grey hound. Before he was very very active and would always eat. I have taken him to the vet multiple times but they cannot seem to find what is wrong with him...I need help! The vet also tested for kidney failure, but came back negative. Should I have them test again? If not, what else could this be? If it is cancer, can it be treated? The vet does not want to test because she is afraid he is not strong enough to go under surgery. Is there any other food that will make him stronger and healther qucikly? I am just lost and I am afraid I am going to wake up and he will be gone. Oh I am sorry to hear that poor Pepino is having these problems. Have any tests been done on the lumps? The type of test I am wondering about is a fine needle aspirate to determine what types of cells they are. How big are the lumps and what do they look like? Has a full set of bloodwork been done? If so, do you know what abnormalities were present? Hopefully I can help you with this case. A cytology was done. At the moment they are checking thyroid again, but don't know what they are questioning. overall didn't show anything that stands out. The lumps are all over his mian body frame (none on his face, legs or tail), they are smaller at first then, flatter and harder. About 3 weeks, 2 weeks with a vet. The blood work was taken, doesn't show a virus, red and white cells seem to be fine. Overall the vet doesn't see a "bullet" to point to. Antibiotics didn't seem to help, in fact they have been stopped to see if his appetite comes back. Seems to be in some kind of pain, but can't find where it is coming from. You're very welcome! This sounds so frustrating! It would be great if you could find out what they saw on cytology of the lumps. I really think our answer is in finding out what the lumps are. 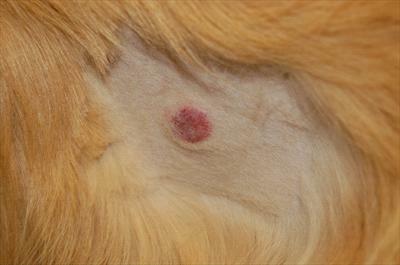 Your vet is the best judge of whether or not they can be biopsied, but most dogs will allow a biopsy with a local anesthetic, so you could ask your vet if this is a possibility at all. By far the best thing that can be done next in my opinion is a biopsy. If you think it looks like any of the pictures above then let me know and I'll give you some more information. Thank you again for all of your help!! When you mention that some lumps are on his neck I am wondering if what you are describing are lymph nodes. If these are lymph nodes then this tells us that we are dealing with either some type of infection or unfortunately a cancer like lymphoma. Usually though a fine needle aspirate of a lymph node is really helpful in telling us whether this is cancer or not. It's really hard for me to suggest a food without knowing his whole case. That's really something that you should ask your vet about. In most cases as long as we are feeding a good quality food that's about as good as we can do. Be careful about some of the stuff that you read online about "miracle" foods and supplements. The key to Pepino's healing here is to figure out what is wrong first and then once we can treat that effectively he will start eating again. I do have some faith in a supplement called Missing Link that helps with general overall health. However, no supplement on its own is the answer here. You may also want to ask your vet about a medication called remeron which is an appetite stimulant that may help perk his appetite up a little until we can get some answers.